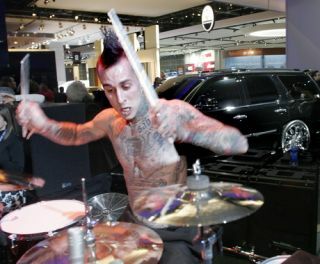 This week has seen Travis Barker and his Blink-182 buddies burst back into the UK for the first time in far too long, and it seems Travis made up for lost time with a gravity-defying solo. The solo came from Blink's Glasgow show earlier this week, and if it has whetted your appetite for the potty mouthed-pop punkers, you can catch them in their full glory at Reading and Leeds festivals next weekend. You can of course read more about the return of Blink in the latest issue of Rhythm, which features a cover interview with Travis. By picking it up you'll also get the lowdown on the tattooed tub thumper's solo record, an up close peek at his kit and a whole load more. You can order yourself a copy from www.myfavouritemagazines.co.uk.